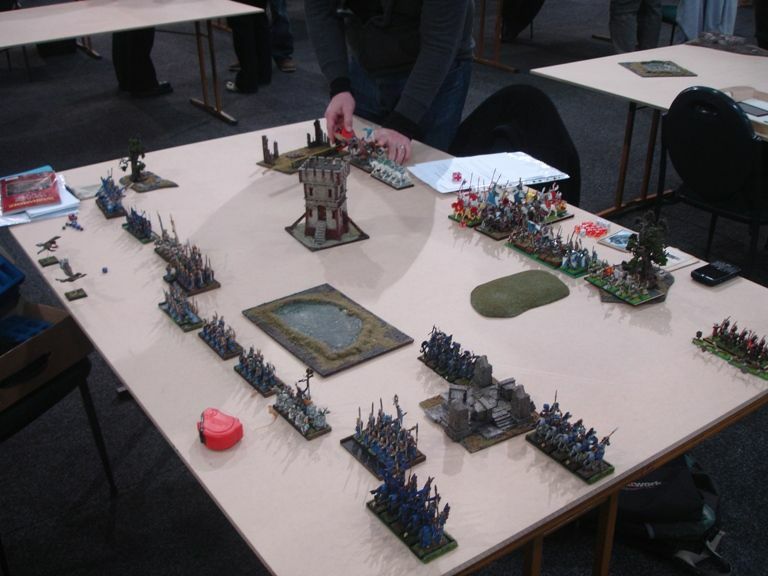 As a first opponent of Wintercon 2012 I faced Ben and his Bretonnians. We started with Battle line scenario as a warm up. Despite having quite outdated army book Bretonnians are force to be respected. Very tough to kill thanks to their ward save and very dangerous if you let them charge in, especially with 2+ lances with characters. What is more, thanks to special rules of Fey Enchantress who led Ben's army, they actually had a chance to start first, which is something unexpected. Ben's army was also unique because it had horde of halbardiers led by a hero and Questing Knights. I must apologize but I cannot remember the magic items Paladins had but I do remember there were no magic banners in the army. Ben's army had a deathstar type of a unit and I knew that I had a tough nut to crack. His Men-at-Arms horde was also quite dangerous to fight head on, especially when led by the Paladin. Fey Enchantress is a dangerous sorceress too with her +2 to casting spells and plenty of special rules. This army is very tough and it is very difficult to earn points from it, especially if the main unit and characters in it remain intact. 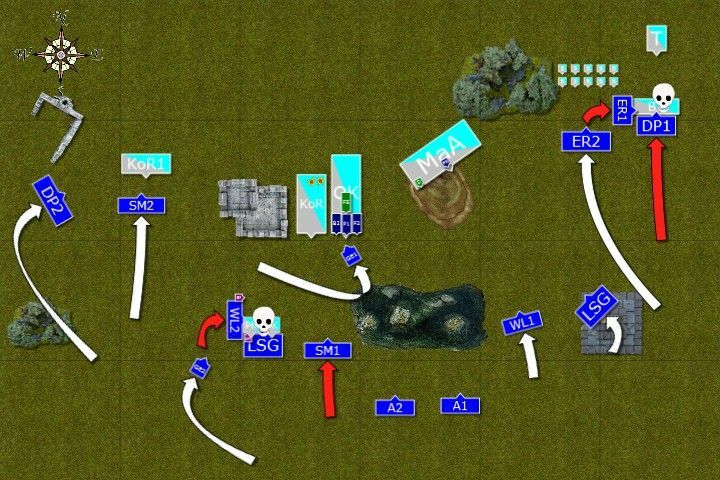 However, I had a chance with my multiple units to set up favorable combats against smaller regiments of Bretonnian army, avoid and redirect two bigger units for a while and then set up some combined charges. 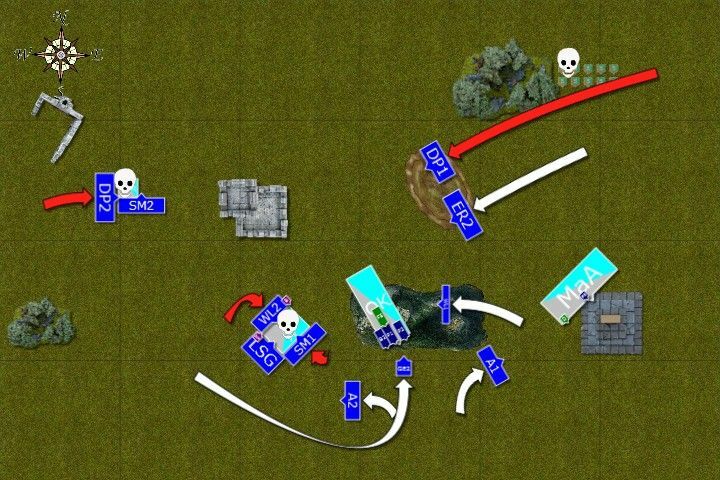 Life magic and Dwellers in particular were not that dangerous against small units so as long as I could quickly eliminate the trebuchet and bowmen I had a better chance to set these traps as no ranged attacks would be aimed at my army. Despite that I was not sure how powerful the magic phase is really going to be and if I am able to avoid big enemy units for long enough. In terms of my own shooting I decided to shoot smaller regiments of knights first as every knight down before the combat helps my own heavy hitters. Surprisingly I won the first turn! Elven cavalry on the Eastern flank moved forward to be ready to attack enemy fire base. 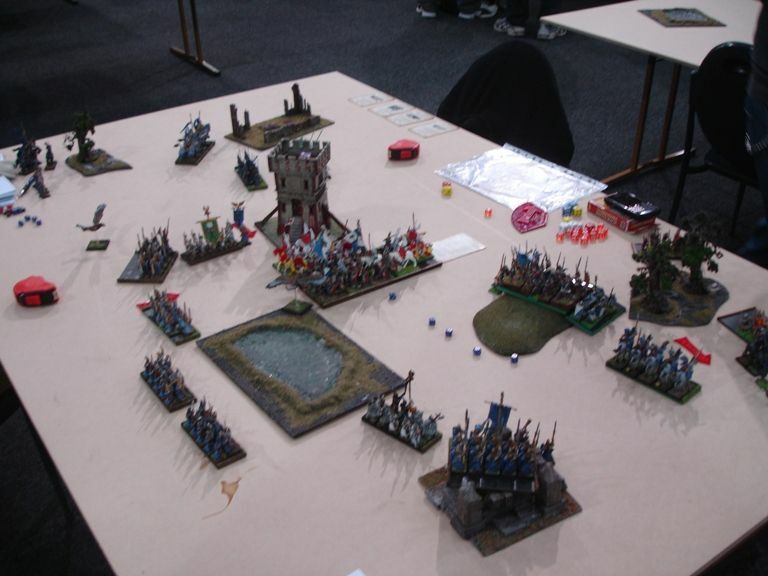 The center of elven formation remained stationary and all archers aimed at medium sized regiment of knights. Their armor was hard to penetrate but one of the arrows found a weak spot and first knight fell to the ground. 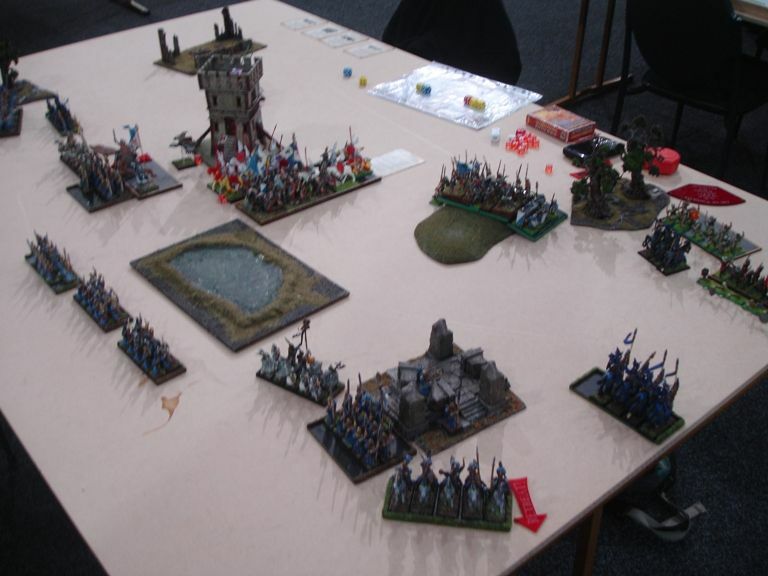 On the West elves advanced too but a little slower to draw the attention of the enemy flanking units. While the regiments moved Archmage begun his duel with Fey Enchantress and destroyed her magical cup as a warning. Bretonnians did what they do best - they attacked, even if only some regiments had a chance to reach their enemies. On the West Pegasus Knights aimed at Lothern Sea Guard with the Archmage. That combat was won by them but elven warriors were determined to stand their ground, especially with their general among them and inspiring sight of battle standard nearby. On the East Men-at-Arms, urged by the valiant knight who led them, also tried to charge the elves but they picked light cavalry as a target. Swift elven cavalry had no problems with avoiding that attack and performed their feigned flight without a sweat. 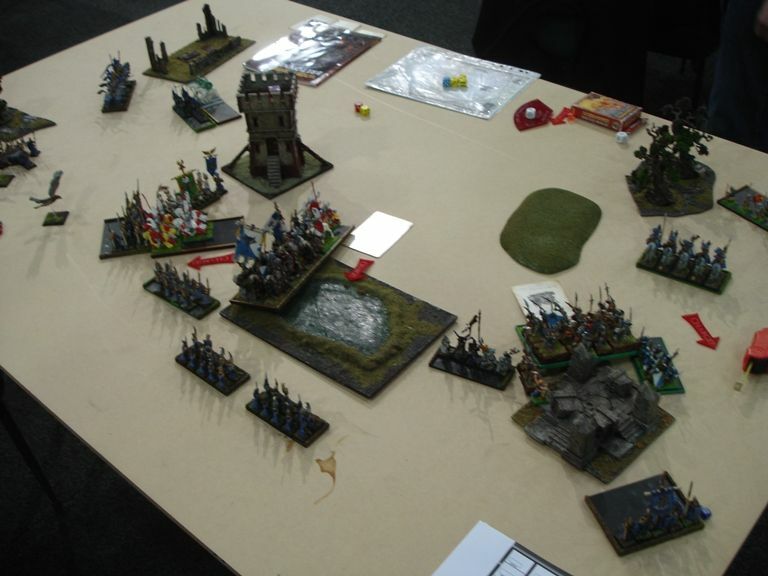 In the meantime skirmishers tried to defend the trebuchet and blocked second unit of elven light horse. They also shot at them and even killed two but remaining elves did not panic. Bowmen picked their flaming arrows and to their own surprise fell down one Dragon Prince. Elves pressed forward. On the West Swordmasters run towards Knights of the Realm with Dragon Princes securing their flank. White Lions charged Pegasus Knights how were quickly destroyed by that ferocious attack. 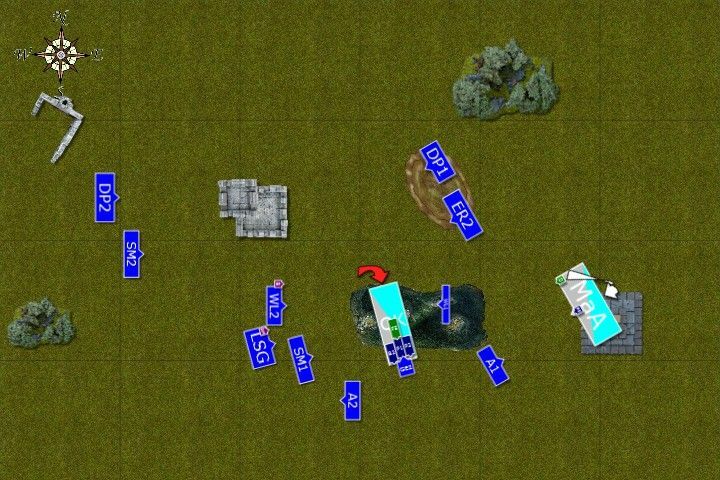 Another Swordmaster unit tried to intercept the enemy Knights too but misjudged the distance. Seeing that all Archers again aimed at that regiment and two more knights fell this time. On the West Dragon Princes and Ellyrian Reavers charged bowmen and even their fence with sharpened sticks didn't save them. Heavy cavalry kept enough momentum to attack the trebuchet behind while light horsemen stormed into skirmishers. Bretonnians, believing in the truth of attack being the best form of defense, charged again. On the West Knights clashed with Swordmasters who killed 3 of them, lost a few warriors as well and the combat continued. Another Knights, outraged at elven lack of honor who kept shooting at them, charged into weakened Sea Guard with the Archmage. However, they completely missed with their attacks and even lost further knight or two and lost combat. They kept fighting though. Questing Knights led by 3 Paladins quickly removed the eagle blocking their way while Men-at-Arms made a very long charge at Sea Guard in the ruins and supported by Fey Enchantress who transformed their skin into stone, they proved to be a very tough opponent for the elves. Sea Guard could not hold against deep ranks and also lost many warriors and had to retreat. At the same time Dragon Princes destroyed the trebuchet and reformed to be ready to destroy another regiment of bretonnian peasants. Elves were not static either. 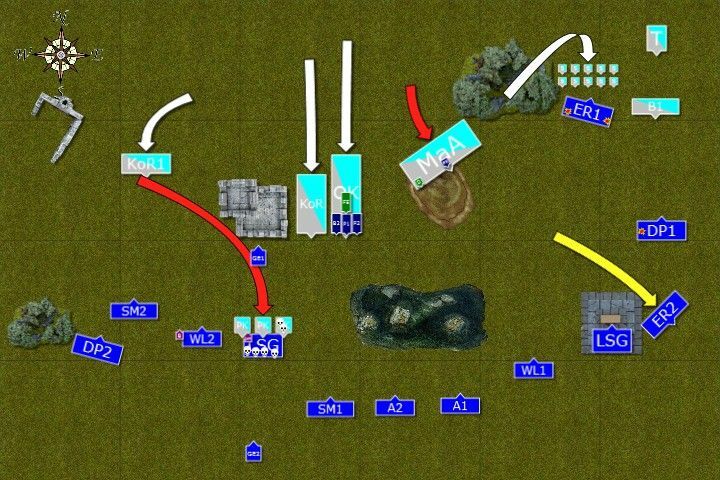 With some of the enemy units pinned down they had great opportunities at devastating flank charges. Dragon Princes on the West helped Swordmasters to finish off 2 remaining Knights. Another regiment of Bretonnian cavalry perished when attacked from 2 sides by White Lions and Swordmasters while another Dragon Princes run down fleeing skirmishers. All regiments then reformed to attack main cavalry unit of the enemy, while Archers moved away from the ling of sight of Paladins who led Questing Knights. 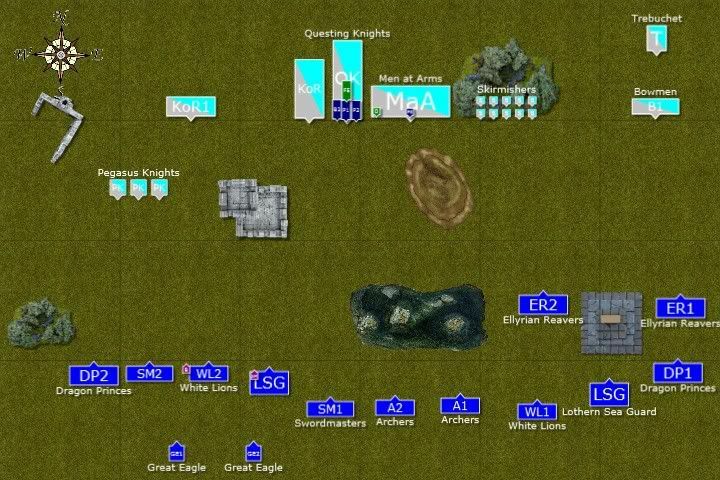 Bretonnians had very limited options now with only two main units remaining. The Knights hunted down yet another eagle and Men-at-Arms reformed to face the enemy. Fey Enchantress tried to cast some spells but somehow all the energy was immediately drained from the area and strange darkness engulfed both armies. 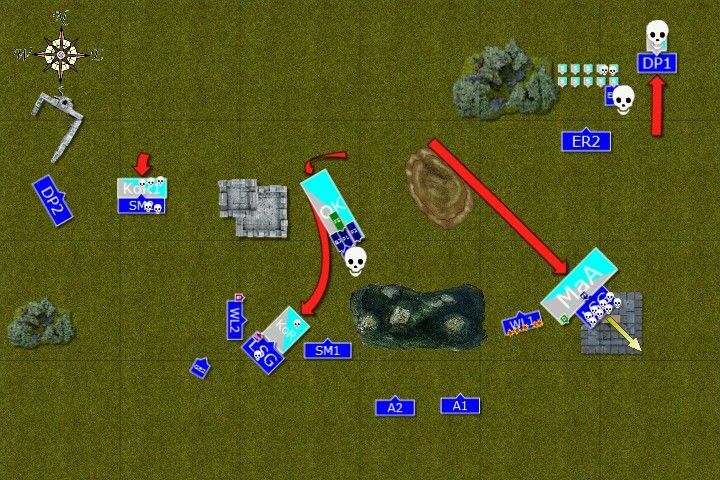 It was not possible to fight and both armies had to disengage. Well, I was really surprised we run out of time but that was it. The game ended after 3 turns and when we calculated the points it turned out I managed to win. 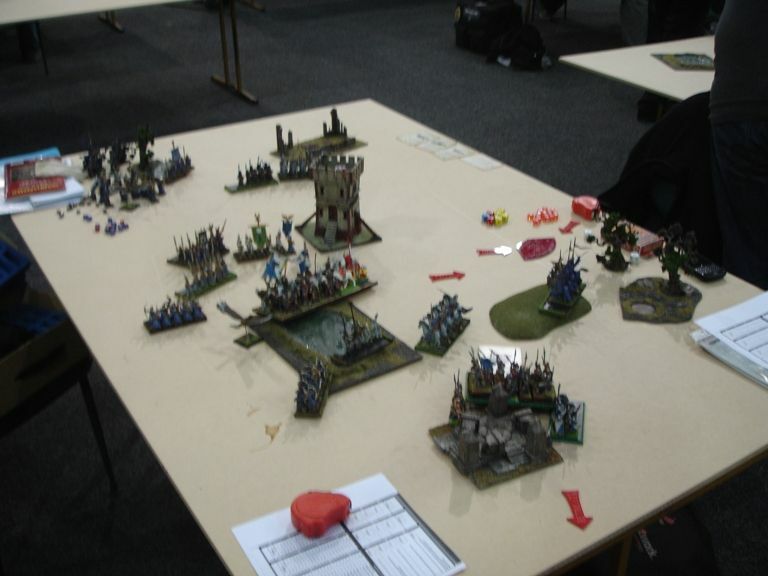 I was very happy because it was very difficult to get any significant victory points from that army and mainly because I made that blunder in turn 2 and exposed already weakened unit of LSG with Archmage for another charge of Knights. 7 of them could easily break the steadfast of my unit but I was lucky to kill one or two and lose only 1 warrior so that they lost combat. Other than that I was happy with the way the game was going. I managed to get the trebuchet quickly and no ranged weapons threatened my small units. I am of course very curious about the outcome of turn 4 as I think I would be able to get the Questing Knights provided all the units would make the charge. Paladins could be much tougher to kill and they would inflict significant damage but with Archers diverting Men-at-Arms and no Regrowth spell I think I might be able to win the war of attrition.